This free web course has been created by Consumers United for Evidence-based Healthcare (CUE), and is designed to help consumer advocates understand the fundamentals of evidence-based healthcare concepts and skills. Registration is open and free of charge. Participants are encouraged to finish the course in three months. Learn more about this course. There is also a free course supplement available called "The FDA and the Regulation of Healthcare Interventions". 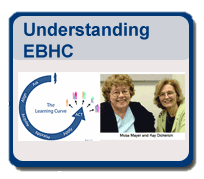 We recommend that you take this course as a follow-up to "Understanding Evidence-based Healthcare: A Foundation for Action".